I think it generally accepted that any major inter-property crossover takes place in some alternate universe, out of the continuity of even the commonly accepted multiverse(s). 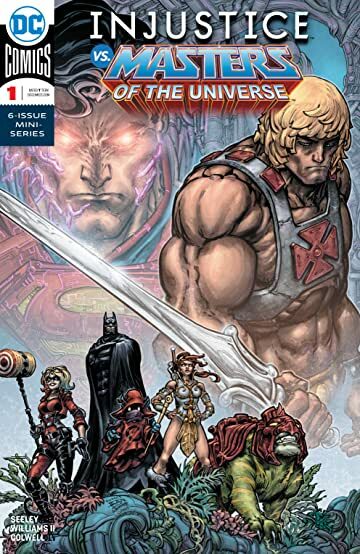 Rarely has it be so blatantly alternate, as Injustice vs Masters of the Universe. So alternate that I’m not even sure what to think. Lets split this up a bit, shall we? On the one hand, we have Injustice. It apparently started as a video game, then spawned some comics, and I fully admit to googling that. There was a page of exposition where Batman tells Prince Adam the history of his Earth. For the casual reader, or at least a reader who doesn’t have to write a review, it was a decent enough summery. Although I still have no idea why there are two Batmans (Batmen? Batsmen? ).